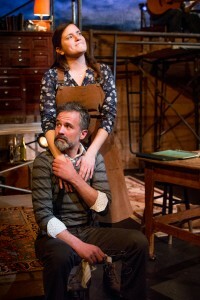 Starting with a breezy, witty and emphatically modern Russian-to-English translation by director Curt Columbus, the Sandra Feinstein-Gamm Theatre production of Uncle Vanya by Anton Chekhov is a darkly comic and cerebral delight. 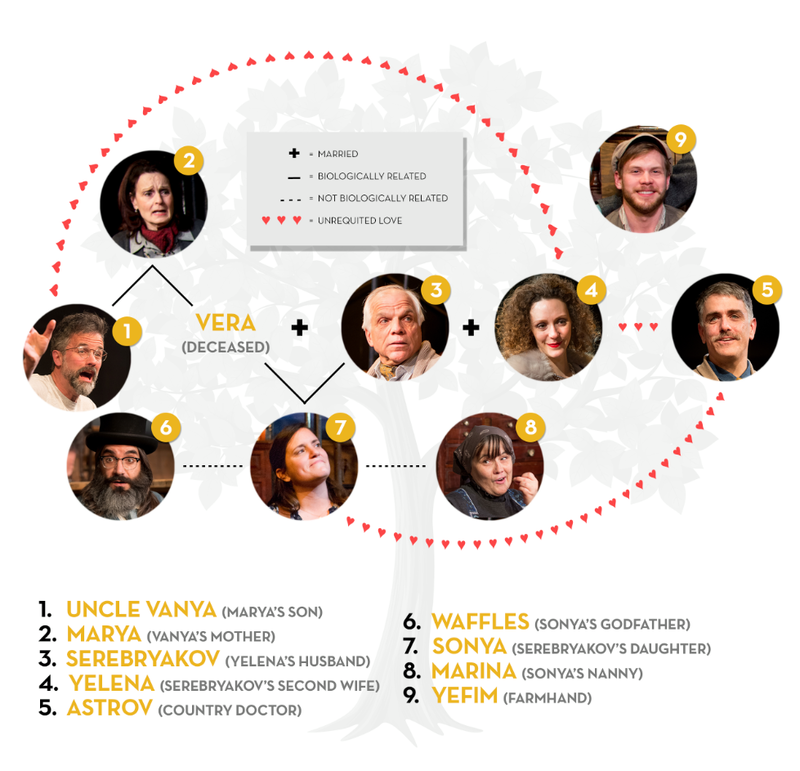 It could be the best production of Uncle Vanya you’re ever likely to see. One of the epic dysfunctional families of drama slowly reaches a crisis point before our eyes as the titular Vanya (Tony Estrella) comes to believe he has wasted his life, never marrying and living on a tiny allowance to run the family estate in order to support the academic pursuits of his late sister’s husband Professor Serebryakov (Richard Donnelly). Sonya (Rachel Dulude), who is Vanya’s niece and the daughter of Vanya’s sister and the professor, has also sacrificed her own happiness to help run the estate. Marya Vassilevna (Paula Faber), Vanya’s mother, worships the professor, the husband of her late daughter, and encourages the family’s sacrifices on his behalf. The professor’s idle second wife, Yelena (Marianna Bassham) is no longer attracted to her husband but has become the unwelcome love interest of Astrov (Steve Kidd), the local country doctor, who in turn has become the unwelcome love interest of Sonya. Marina (Casey Seymour Kim) is Sonya’s nanny and de facto stepmother. Telegin (David Rabinow), known as “Waffles” because of his facial skin blemishes, is something of a handyman and hanger-on at the estate, a descendant of its original owner who sold it to Vanya’s family. 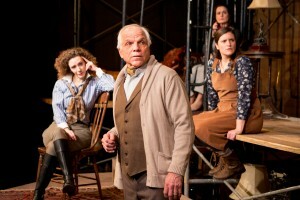 Yefim (Gunnar Manchester) is a farmhand. 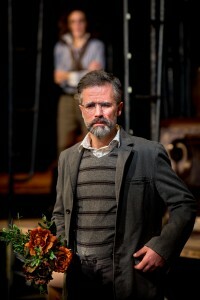 Uncle Vanya is probably the most frequently staged play by Chekhov, one of the acknowledged masters of drama. It has been widely parodied – the Reduced Shakespeare Company abridged it to a mere three lines plus a sound effect: “Are you Uncle Vanya?” “I am.” (gunshot) “Ouch!” – adapted – The House in Providence by Epic Theatre moves the action from a Russian country estate to a multi-family tenement in Providence – and navel-gazingly explored – Vanya on 42nd Street by Andre Gregory. The story is universal, looking back on the choices everyone makes throughout life and the inevitable regret that comes from wondering what would have happened if those choices had been different, the flip side of It’s a Wonderful Life. All of the characters are unhappy in their own way and find their own answers to this question. Eventually Vanya becomes delusional in his dissatisfaction, claiming that he could have achieved greatness comparable to Schopenhauer or Dostoevsky if he had been given the advantages of the professor instead of the other way around. The rich story and dialogue are a paradise for the virtuoso actors of the Gamm cast who mine them for all their worth. Estrella as Vanya is outstanding as the central figure, his rage bottled up for decades threatening to boil over in homicidal fury, eventually simmering to spent resignation. Dulude as Sonya, convinced she is too “plain” to attract the attention of Astrov or any man, masterfully exhibits the pain of surrender to what she believes is her fate of tending the estate and endlessly sacrificing for others, a fate in which she finds redemption even if a modern audience sees nothing but tragedy. Kidd as Astrov and Bassham as Yelena brilliantly complete the awkwardly unromantic quadrilateral, each of them resigned to their fate as well, tragic figures by their own description, bemoaning their own wasted potential. Donnelly as the professor perfectly captures the clueless yet imperious manner of the academic who remains convinced he is a great man despite much evidence to the contrary, especially that no one reads his work. The set by Michael McGarty deserves praise, cluttered but not distracting, with exactly the right patina of rough wood to evoke the feel of a country house. The music is beyond eclectic but well done, ranging from “Love Will Tear Us Apart” and “Boys Don’t Cry” to “Xanadu,” with Manchester playing an extraordinary variety of instruments. Don’t miss what could be the funniest tragedy of this theater season.